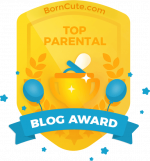 These few weeks have been challenging for both my hubby and I. On top of the craziness at home where the kids took turns to fall sick over six weeks and me getting injured, we sold our current place and bought a new one! Total madness, right? All in six weeks. Haha. That means major decisions one after another, followed by loads of planning, scouting around for interior designers (we’ve decided on one! ), googling for ideas, scouring Pinterest late into the night and basically just getting ready for our third home together. Getting a new place is both exhilarating and stressful at the same time, and we haven’t really been able to get a restful sleep. That’s all part of the package of getting a new home, and after getting past the most stressful parts of selling and buying, and the stars aligning for us for that to take place smoothly together, now it’s the time to stress over the renovation plans. 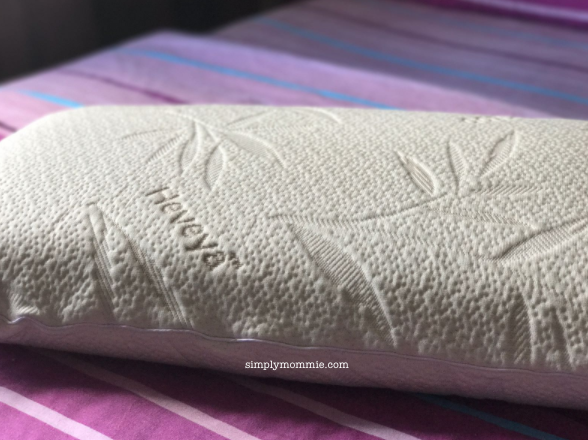 Last week, in the midst of a combination of Taobao and Pinterest madness, European Bedding sent over their Heveya 100% Pure Organic Latex Pillows for us. I think it’s a sign for us to take a rest, y’think? We didn’t think it would make a huge difference honestly. I mean a pillow’s a pillow, right? That’s before we used the pillows of course. After the best sleep ever in weeks, we have to come to the conclusion that not all pillows are created equal. In fact, in the course of almost 11 years of marriage, we’ve tried many types of pillows. From normal pillows, contour pillows, Korean pillows, buckwheat pillows, to latex pillows, you name it, we have probably tried it. My hubby had some chronic neck pain so we’ve seriously tried many types of pillows, and he has gone pillow-less, and also tried just sleeping with a towel rolled under his neck on top of our pillow adventures. You can’t really blame us for being skeptical about pillows after all we’ve been through. Yet, to our surprise, the soft Hevaya latex pillow supported our heads so well, the effect the next day was just amazing. We slept through the night (such bliss), and woke up feeling refreshed after 7 hours of sleep. Unlike the fluffy pillows that flatten over time and usage, the 100% organic latex pillow’s natural elasticity will continue to provide excellent support night after night. 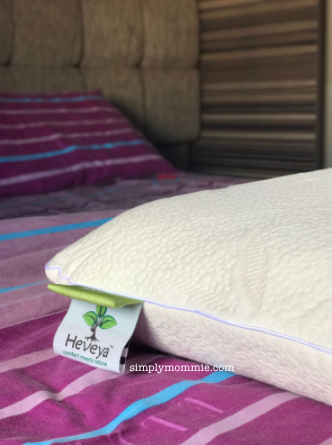 The Heveya latex pillows have an open cell structure and are designed with ventilation holes. This ensures good ventilation and moisture regulation for a comfortable sleeping temperature. 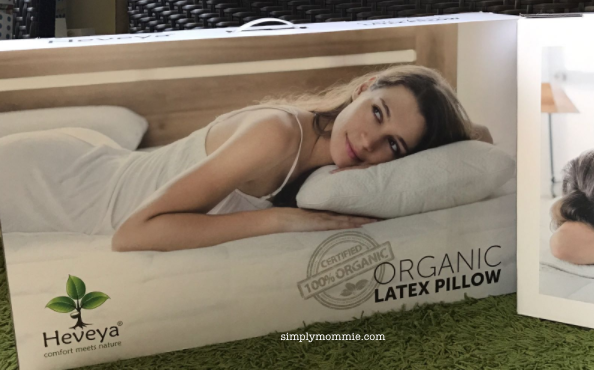 What’s more, the natural organic latex pillows are the perfect solution for people prone to allergies as they are naturally anti-microbial and dust mite resistant. No chemicals added! 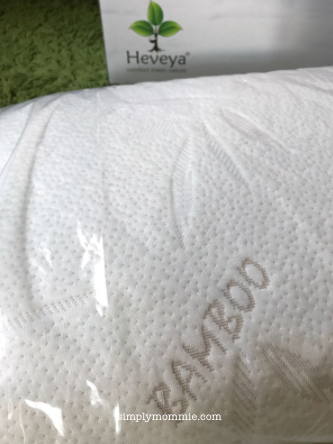 The Heveya latex pillow also comes with a soft and luxurious bamboo cover which is naturally anti-bacterial and anti-fungal. It comes with a zipper for easy unzipping and cleaning experience for better hygiene. Bamboo is a natural eco-friendly fabric which keeps the head and neck dry and cool. We are really pleased with our new pillows and I honestly never thought that pillows could make such a big difference to sleep quality. No neck pains, stiff necks. Just restful sleep, waking up feeling refreshed. Now that’s quality sleep. Give it a try at European Bedding’s showroom at Eng Hoon Street. They carry latex mattresses as well if you’re looking for mattresses. For the month of September 2017, they are giving away 2 latex pillows with every mattress purchased. 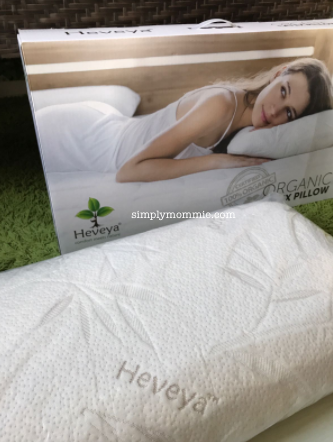 Disclosure: We were gifted two Heveya 100% organic latex pillows. No monetary compensation was received. All opinions are ours.